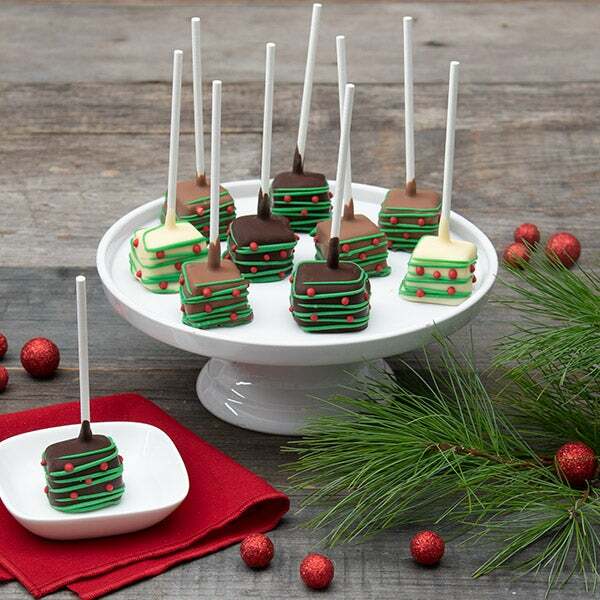 Christmas Cheesecake Pops is rated 4.9 out of 5 by 7. Rated 5 out of 5 by kathyg from Cheesecake Sent to a friend for Christmas . They loved them!!! Rated 4 out of 5 by CC2018 from Great Gift! I bought this as a Christmas gift for my extended family in New Mexico and I received great reviews afterwards! Rated 5 out of 5 by Pops from Unique Gift This was a stand out gift this year. We received a call as soon as the delivery was made expressing how much they were liked. Rated 5 out of 5 by Moritz124 from Great taste. The recipient of this gift was very pleased with the taste and look of this product. Rated 5 out of 5 by Nilloc from Great Christmas treat Great online experience and easy fast shipping arrived on time. Received this report from recipient. Food Report: The cheese cake pops are fantastic! They're a wonderful gift. He has managed to eat a few more than his share, but don't worry, I'll hold my own. Rated 5 out of 5 by NormJW from Fun Treats Ordered these for a Christmas dinner dessert and everyone enjoyed. They were delivered right on time and the packaging was superb, nothing damaged. That in itself was amazing. They come all individually wrapped in clear cellophane with a gold twist tie. Very classy. Celebrate the most wonderful time of the year with these decadent treats! We've taken squares of irresistibly smooth NY style cheesecake and gently dipped them into baths of imported Belgian chocolate. Each delicious pop is then decorated with ribbons and dots of festively colored confection to create desserts that are impossible to resist!